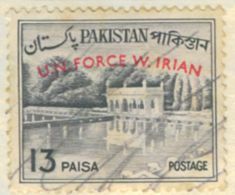 This 13 Paisa stamp earlier issued in 1962 (with redrawn Bengali script) was over printed with words "U.N. FORCE W.IRAN" on 15 February 1963. 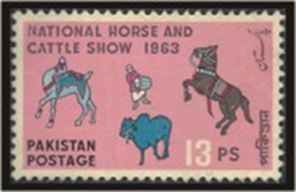 Horse and Cattle Show at Lahore Fortress Stadium has been one of the major events to welcome the spring and had been held for years in the months of March and April. The 13 Paisa stamp above was issued on 13 March 1963. The stamp shows the dancing camel and horse with a drum beater in between and a cow underneath. A set of two stamps was issued on March 21, 1963 on the eve of promulgation of the land reforms. 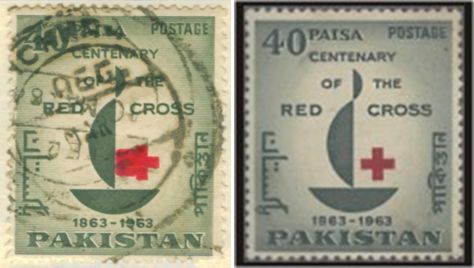 The 13 Paisa stamp was in orange brown colour, while the 50 Paisa stamps was in bistre brown colour. 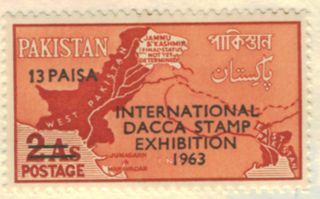 On the eve of the International Stamp Exhibition in Dacca, an earlier issued stamp of 2 Ana denomination with maps of East and West Pakistan (1960) was overprinted with words "INTERNATIONAL DACCA STAMP EXHIBITION 1963". The stamp was issued on March 23 and revalued at 13 Paisa, since Pakistan switched over to decimal system in 1961. On the eve of the centenary of the Red Cross, a 40 Paisa stamp in red and deep olive colour was issued on June 25, 1963. Pakistan is rich in archaeological remains of the civilizations that once thrived in the areas that now constitute Pakistan. From Mehrgarh civilization (7000-9000 BC) to Meonjodaro and Taxila (2500 BC), there are numerous remains that are now protected by the UN. 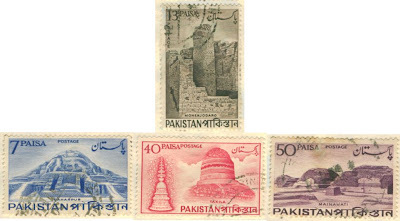 The 13 Paisa stamp in sepia colour on top shows remains of Moenjodaro. 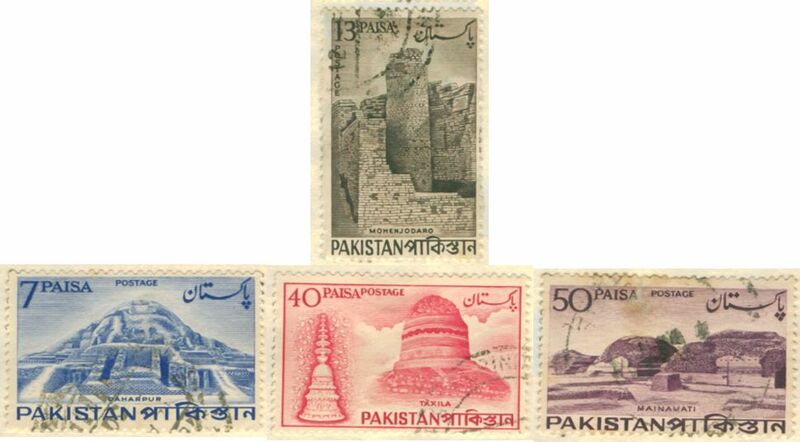 The blue 7 Paisa stamp on left shows Paharpur archaeological site, located in the Khyber Pakhtunkhwa province. The 40 Paisa carmine colour stamp shows stupa of Taxila. The deep redish coloured 50 Paisa shows remains of Mainamati, a Buddhist site near the city of Comilla in East Pakistan (now Bangla Desh). The set of four stamps was issued on September 18, 1963. Public Works Department (PWD) was established by the British during their rule over the British India in 1863. 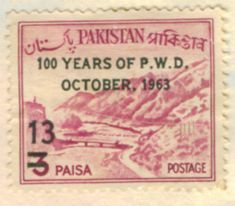 On October 7, 1963 on the eve of the centenary celebrations of this pre-independence department, an earlier issued stamp of 3 Paisa in 1961 was repriced at Paisa 13 with overprint "100 YEARS OF P.W.D OCTOBER, 1963". The stamp had the older version of Bengali script which was later changed in 1962. Mustafa Kemal Attaturk of Turkey is revered in Pakistan as both Pakistan and Turkey enjoy the best of brotherly relations. 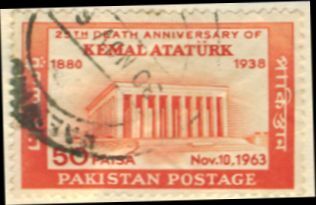 On the eve of 25th death anniversary of this great Turk leader, a 50 Paisa stamp showing the Ataturk’s Mausoleum was issued on 10 November 1963. The stamp was red in colour. 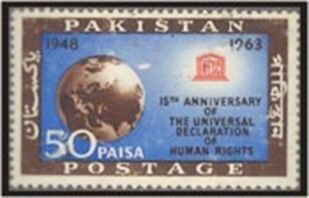 On the eve of the 15th anniversary (1948-1963) of the Universal Declaration of Human Rights, a 50 Paisa stamp was issued on December 10, 1963. 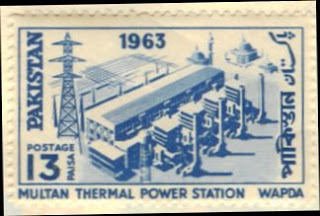 The last stamp of the year was issued on December 25, 1963 to mark the completion of the Multan Thermal Power Station. The Paisa 13 stamp was ultramarine in colour and showed the overview of the building.